We left Dubai at about 3pm. 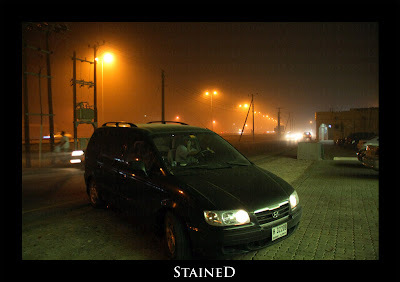 We were hit by a sand storm as we entered Al Ain. 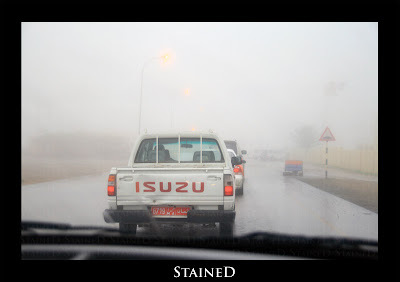 Visibility had dropped to about 50 metres and in some places to about 20 metres. 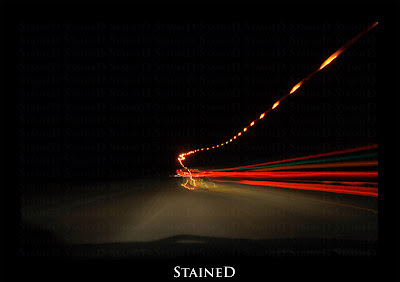 This limited the speed we could drive at, slowing our progress... It also rained heavily and I had a pleasant time getting wet whenever we stopped. Rain and sand were taking turns in lashing our cars but we all enjoyed this great (though a little dangerous, as a construction board almost fell on one of our cars) beginning to our trip...we were loving it. This picture was taken at the Masjid we prayed at and went to the toilet which to my nightmare ended up being an Indian style bathroom though it was clean...this was the first time I had used one after 6 years (last time when I visited Muscat) and honestly I still don't know how to use one. Photography was prohibited around the border check post so I stuffed my camera inside my bag being more cautious than required. On entering Oman we saw a few shops and this small Masjid. 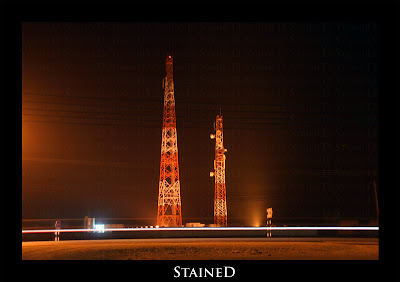 The bus stop sign, telephone booth and Masjid combination was a shot not to be missed. 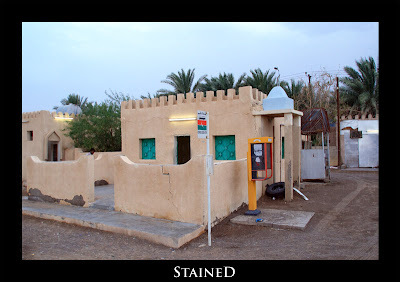 We entered the first major town on Oman called Ibri at dinner time. We looked for an adequate restaurant but settled for a fast food (Jabal Al Noor type) restaurant called Quick Meal. We had the weirdest Shawarmas, decent chicken pieces (KFC style) and burgers. Fortunately they had a proper toilet. 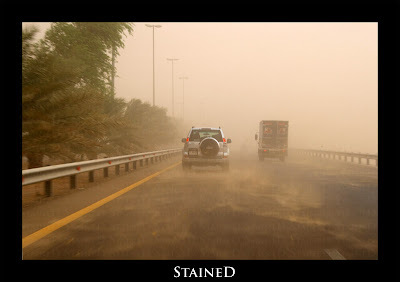 The Sand storm had troubled us (making it quite dangerous to drive) till we reached Ibri where the storm seemed to have passed but sand was still lingering in the air. We drove the whole night covering about 700 kilometres. 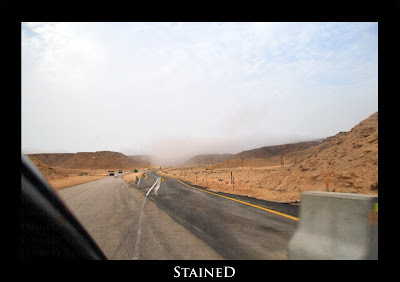 By sunrise, we were only 100 kilometres away from Salalah. 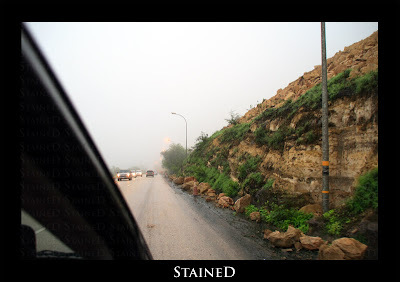 This shot was taken when we were about to enter the main Dhofar mountains (though we were kinda already in it). Salalah lies on the other side. 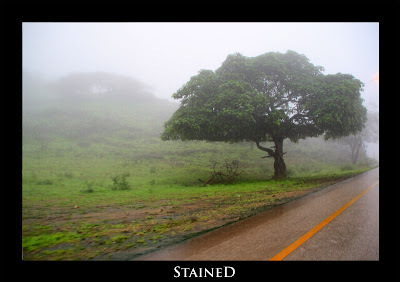 The fog you can see are the monsoon clouds that hit Salalah every summer. When we enter the mountain range, after a few kilometres (it felt like kilometres though it could be less) we were welcomed to a checkpoint where the tourists were asked to stop, show some paperwork and state the number of people entering. The fog was quite thick so the traffic was moving slightly slow. As we drove deeper into the mountains, the fog and greenery started increasing. I got so excited as this was really my first time in such an environment, I starting clicking away like mad without bothering to check my settings or my framing. I ended up with most of my pictures turning out bad. That really bugged me as I edited the pictures though sense did kick in on the other days so not all is lost. 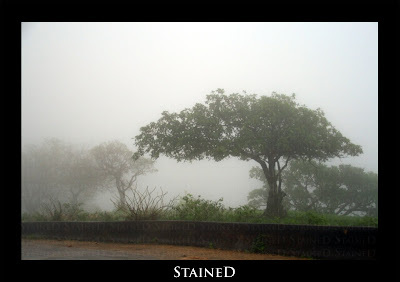 I clicked a lot of trees in fog picture this being the first good one. There were parts of the road where the fog was less which gave me an opportunities to look at my surroundings more carefully. Yet another tree in the fog shot. I really liked the way they looked in reality so I just couldn't stop myself from clicking each and every possible shot. We hadn't booked an hotel as we were confident we'd get rooms easily. We were mistaken!!! We first went to the hotels we had read about online and they all were full. 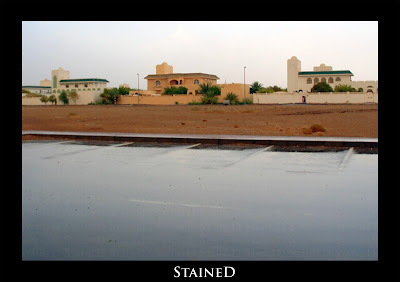 Panic started setting in and so we decided to drive out of the city to a suburb-like place called Saadah. There luckily we managed to get a 3 bedroom flat. It was nice and clean except for the toilets. Now there were two toilets and only one of them could be used by me (the other one was Indian style). But the usable toilet was not clean enough for me (but it was fine for everyone else). But that problem was soon solved by my mom who cleaned it up for me. Anyway moving away from my toilet problems, we slept for a few hours and got out in the evening. We had reserved this day as a shopping day as it would be too late to venture out of the city. We went fruit shopping first. Bananas of many different varieties were available...We also got some coconuts, papayas, chickoos and some other fruits (I don't know what their names are)... 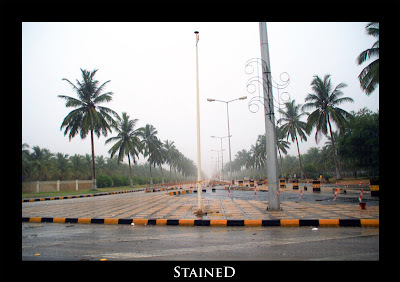 They also have a Clock Tower roundabout (picture later) where one of the roads leads to the Airport. This is that road. 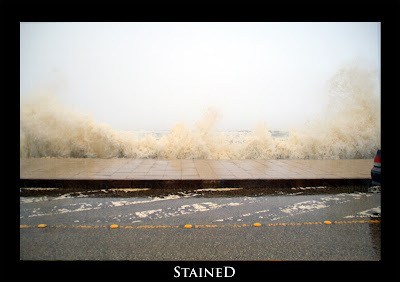 Huge waves (in comparison to Dubai) kept hitting the coast with water flooding the road running next to it. My niece's head got wet as she was looking out of the car window as we were hit by a wave (well not literally, just a huge amount of water that bounced into the air on hitting land). 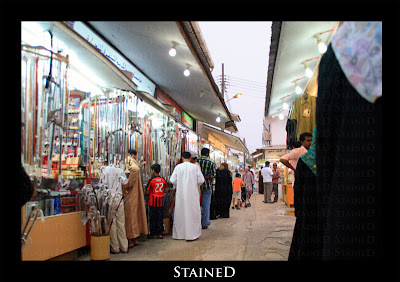 We visited the Bazaar (forgot its name) to pick up some souvenirs and some abayas. Supposedly the abayas are very cheap in Salalah which made my sister and mom very happy. I also noticed that the ladies liked to wear long abayas here that drags behind them so that their footprints are not cleared from the sand/ground. It's because of there fear of the old magician that used to live in this area many centuries ago though I'm guessing its become more of a fashion/society statement now. That's it for now!!! wow, that looks like a difficuilt ride. We flew to Salalah - Al Jazeera is really cheap to Salalah! you seem to be really finicky about toilets. Spoilt arent you? hehe. Your mom actually cleaned it for you! and cows! DUDE you HAVE to holiday in India.. turst me, I dont remember any cows in Salalah... or am I just immune to noticing them around. WTF! That looks bloody awesome!!! And I can't believe I haven't been there yet. 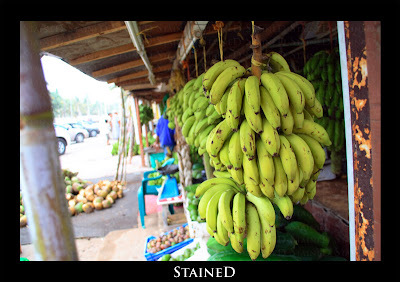 The Fruits were totally amazing..I haven't had so many yummy bananas for such a long time though the coconuts and sugarcane were a disappointment. That is one of the reasons I haven't traveled much. Just Oman and Kuwait. This was officially my first vacation with my family after 16 years (unless you count a 3 day trip to Muscat). The cows were everywhere in the mountainous regions. Maybe you didn't go high or deep enough. I've been to Turkey. Go there. You will like the place. About Oman, if my friggin' friends can wake the hell up early atleast once on a holiday I would have gone to Oman last year. Hmph! Same case with Jebel Hafeet. Double hmph! Amazing pictures..!!! Have never been there, but I think a trip to Oman is just around the corner..!!! My fave pics are 3,6, 10 and 11. Awesome. I'm so parched for rain, I could just stand there and soak myself up. Its true the best time to go would be now, and a trip is long overdue. It reminded me a lot of Malaysia as well. The greenery is just like a soothing balm. I think for those of us who come from tropical backgrounds, miss all that lushness. All this artificial greenery just does not do it for me. One request jaani, the next lot of pics, pls nmbr them. It makes commenting easier for us old ladies. Hee hee. I had to write them down to keep track.